I thought I had two really nice things going for me this morning: working quietly on a book project at home and four nice sheep grazing out in the front field. When you love wool and all the sensual things you can do with it, sheep are charming animals to own. After all, they’re really not much trouble – usually. 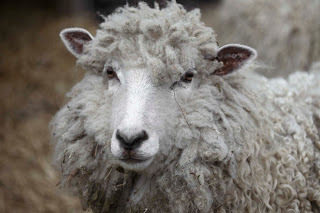 I was just settling in to study the “votes” from the knitters who’ve been sharing their wonderful advice and experiences through our website survey, when I heard some unusual bleating coming from our field. The noise was coming from the only one of our four sheep who was currently inside the sheep fence. Sorrel and Rosemary (the 2-year-old twins), and even old lady Esther, were happily foraging along the driveway on the wrong side of the fence. Sage, the twins’ mom and the vocalizer, was apparently wondering how they all got out there while she was still inside, and she was pretty frantic about telling them about it. They, on the other hand, couldn’t have been more content. So much for working at home! You know what they say about herding cats, but that’s nothing compared to trying to persuade perfectly happy sheep to follow you back into their field. All the tricks that usually tempted them failed -- that grass-on-the-other-side-of-the-fence was so very delicious. I needed a good sheep dog, or at least a fellow shepherd, but the neighborhood was discouragingly quiet and empty. The mailman came along and seemed to think we were quite a quaint pastoral scene – me and three happy sheep, close but carefully out of my reach. “Do you make your own sweaters? !” he called, to which I ungraciously grumbled something about buying all my sweaters from now on. I resorted to going back to the house – partly for bug spray and my bug-off hat and partly to phone whatever good friends I could muster. Bill got there in less than 5 minutes, and the two of us began some stealthy herding operations, trying to ensure that the sheep didn’t eliminate our neighbors’ vegetable garden or head into town or into the woods. That’s when Sage, all this time alone in the field, decided to jump the fence to join the other girls, so now we had four sheep outside and no one calling them in. There’s no point in running at them or trying to catch them – they’re strong, fast, and stubborn. And did I mention that the grazing was so good out there in freedom land? Only some very lucky timing – and more good friends! — got them back where they belonged. Tom and Sandy arrived by car at the exact moment the sheep were cruising by their gate. Seeing the car as an obstacle, they took a sharp left and went straight through the gate into their field as though that was the destination they had in mind all along. I just checked them — again: They seem pretty tired out, to say nothing of well fed, after their adventure. Maybe I’ll work somewhere else tomorrow. Click here to give us your thoughts, opinions, and information on all things knitting. You could be published! And you might win some books.